Glisar is a mother to her four-year-old son and said balancing life between being a mother, an athlete and a student can be quite chaotic, but having a detailed schedule is the key to her success in all areas. Being a full-time student and an athlete already provides Glisar with a busy schedule. Being a mother makes that schedule even more demanding, but Glisar has her schedule down to a science. She takes her son to preschool at 8:15 a.m. every morning. After she drops him off, she either goes to her classes or practice, depending on the day. Whether she has class or practice in the morning, Glisar then picks her son up from preschool and takes him to daycare at 11 a.m.
Glisar then returns to campus for class and looks forward to picking her son up as soon as she can. Glisar said a few times she has had to bring her son to practice, but the coaching staff and her teammates help out so she can get her training in as quickly as possible. Being a mother, the toughest part of being a track and field athlete is leaving for her meets. Glisar’s organization and drive as a caring mother are part of her success as a student-athlete, head women’s track and field coach Lucky Huber said. 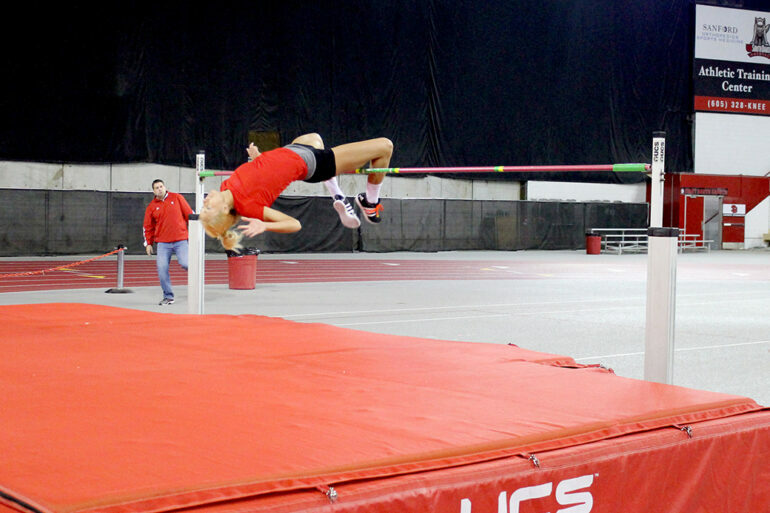 Being an All-American high jumper and a scholar athlete is no easy feat. Huber said Glisar’s determination to be the best at what she does is due to the focus and determination she has. Because Glisar, as she calls her self, is a nontraditional student athlete, she has to plan her day around her son, school and athletics. To do all three, Glisar has been able to make a custom schedule that allows for her to spend as much time with her son, attend her classes and get her training in. “She comes into practice at an off time so that she can take the classes she needs to,” Huber said. Not only are Glisar’s abilities as an athlete and a scholar noted, but both Huber and pole vaulter Emily Brigham said Glisar is someone everyone wants to be around. Brigham trains with Glisar and has classes with her, and she said she looks up to her because she is not only a great athlete, but also a driven individual. Glisar tied her own outdoor school record of 6’0 March 21 at the Baldy Castillo Invitational in Tempe, Ariz.. She’s hoping this strong start to her season will allow her to reach All-American success again. This is Glisar’s final year competing for USD, but it won’t be her final year being a Vermillion resident. Glisar will graduate with a degree in Communications Sciences and Disorders this spring and will be enrolled next fall in USD’s audiology graduate program. Glisar said she couldn’t imagine a better scenario. Her fiancé, Brandon, and their son have really enjoyed living in Vermillion for the past few years.